"Back in 2008, my mother called me to ask if I was involved in preparations for the Beijing Olympic Games Opening Ceremony. 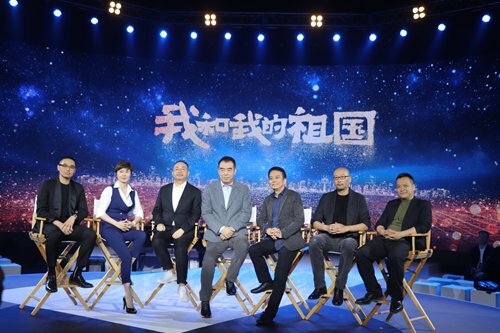 I wasn't then, but this time I can confidently say that I will be responsible right from start for producing Me and My Motherland," Chinese director Zhang Yibai said at a press conference in Beijing on Wednesday announcing his new film project. Zhang, however, will not be alone. He is one of seven directors that will work on the film, an anthology that will tell different stories about ordinary Chinese during major historical moments since the founding of the People's Republic of China, which will celebrate its 70th anniversary on October 1. The film is scheduled to hit cinemas that very same day. Huang Jianxin, the film's producer, was one of two filmmakers who directed the film The Founding of a Republic, which debuted in theaters in 2009 for the 60th anniversary, noted that both himself and the seven directors were all born between 1950 and 1990 and therefore will be able to use their experiences of these historic events to make the film authentic and engaging. Chen Kaige, who in 1993 became the first Chinese director to win a Palme d'Or at the Cannes Film Festival with his Farewell My Concubine, will be the lead director on the film. This is not the first time that one of Chen's films has ties to China's National Day. In addition to major works such as The Promise (2005), Chen also filmed The Big Parade, a film about the National Day Military Parade held in 1984 on the 35th anniversary of the People's Republic of China. Chen noted that he was actually present at the 1984 parade as he was given permission to shoot footage of it. Director Xu Zheng wasn't present at the event, but sent a video message. In the video, he recalled how he and his colleagues shed tears in front of the TV as they watched the colorful firework footsteps that looked like they were walking to the National Stadium during the Beijing Olympic Games Opening Ceremony. According to Huang, Me and My Motherland aims to stir Chinese people's memories about these important moments through inspiring and touching Chinese stories.